Art and design have always been intertwined with each other since they are closely interdisiplinary fields. It is not netiher right not possible to relate to one of them without taking the other into account. Art without design cnnot surive in today's world as design without art will not satisy the end-users. 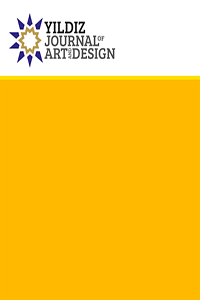 Yıldız Journal of Art And Design, YJAD, a biannual journal, is online and electronic platform that takes the ideas above as its core understanding of the relationship between two highly academic areas. With this belief in mind, YJAD prublishes original papers of academic quality that center on the these two key concepts. Within this framework, YJAD is an "internationally peer-reviewed" journal. The aim of YJAD is to realize a plaform for academicians, researchers and scientists carrying out research in the fields of arts and design which publish formal and well-written high quality papers. YJAD aims to create a database that will support further developments in the fields of art and design. Therefore, YJAD endeavours to publish research articles and scientific papers which have a sound scientific quality. The editorial board scrutinizes the submitted work in terms of content and form alike before referring it to two referees. The views of the advisory board isalso be taken into account at this point. For a submission to be published, both of the referees must aprrove it. Referees might demand revision or expansion of the submitted work, which the author must complete within the given amount of time. Authors are generally informed about the decision regarding their submission approximately in three months. It must be kept in mind that all the papers submitted for consideration will be checked against plagiarism via the iThenticate platform. No fee is charged for article processing. YJAD has an open access policy, by which interested parties can access the publised articles via the DergiPark platorm. YJAD operates under CC BY-ND licensing. Authors keep their copyrights on their studies after publication. YYAD is currently indexed in the following indexes. For furher information on Author Guidelines, please see Author and Manuscript Guidelines section. “SANAT OLMAK” YA DA “SANAT OLMAMAK” GERÇEKTEN BÜTÜN MESELE BU MU?